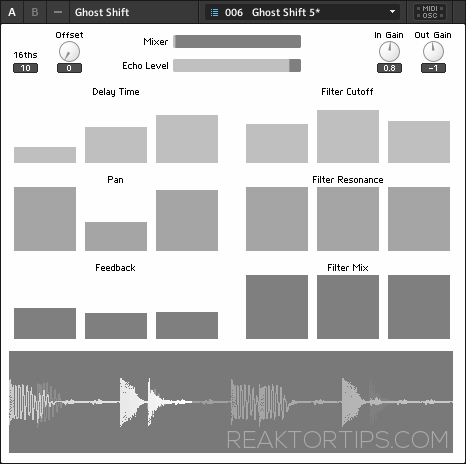 Here’s how it works: you set your number of delay taps – I find three works well – in the Ghost Shift instrument properties. 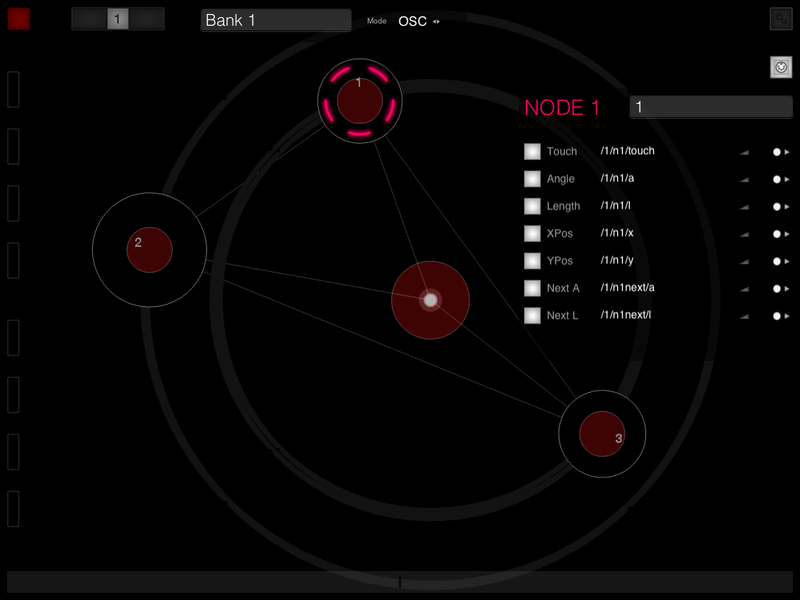 The node visualizer instrument is voice-slaved to Ghost Shift so its number of nodes / voices should auto adjust. If it doesn’t, turn Reaktor’s audio engine off and on again. Notice that every node parameter is active, from angle and length to X and Y. We’re going whole hawg here, using every part but the oink. Also activate the ribbon, which controls the mix of dry and wet signal. 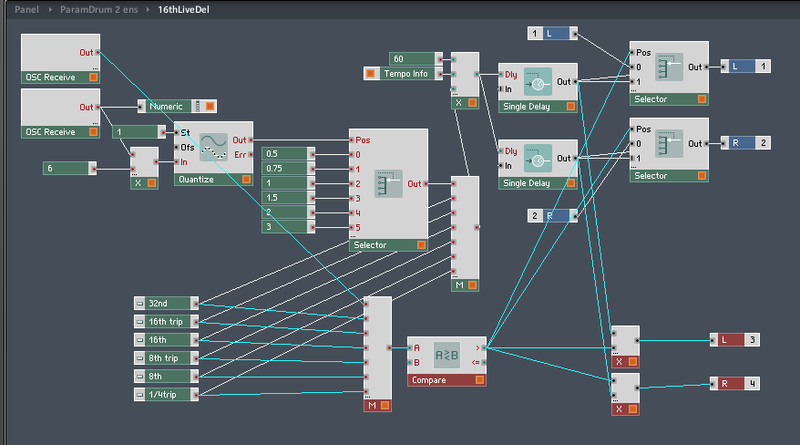 This entry was posted in Effects, Ghost Shift, News and tagged controllerism, delay, echo, effect, Electronica, free, instrument, Konkreet Performer, Multitap Delay, OSC, reaktor on August 19, 2013 by peterdines. 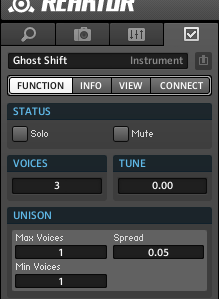 Ghost Shift is a delay effect based on an earlier version of mine called Pumpkin. 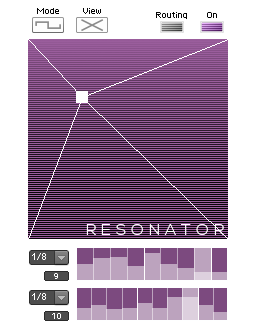 I’ve reskinned it, added functionality and fine tuned the filter and feedback parameters for easier sound tweaking. …is gonna give you more delay taps, and magically, the number of controls in the delay time, pan etc. 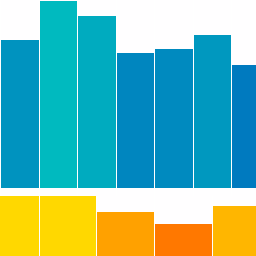 graphs will auto-adjust to the number of voices / delay taps. Each voice can have its own delay time as a multiple of 16th notes, separate pan, feedback and filter settings. I’ve included just a handful of presets because the settings are going to be highly dependent on the material you’re running through the instrument. Really sparse input with lots of space can have more delay lines and more filter feedback. A more full audio track, like a drum kit, will benefit from no more than three delay taps, widely panned, and not much feedback. Let experience and experiment be your guide. 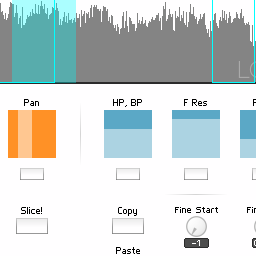 This entry was posted in Effects, Ensemble, ensembles, Ghost Shift and tagged delay, echo, effect, filter, instrument, plugin, reaktor on July 1, 2013 by peterdines. I found a terrific little dubby echo here courtesy of Boscomac and decided to hotwire it into my Paramdrum ensemble. Whenever one of the beat repeat buttons is engaged, the “compare” module detects that its output is greater than zero – this changes the multiplier from zero to one on the extra outputs where the sound is directed to the Echophonic effect. If you have ParamDrum it’s a quick and easy modification. This way, the dry signal doesn’t normally go through the Echophonic and it becomes a haze that drifts around the stuttering when you engage the beat repeat. This entry was posted in Ensemble, ensembles, Granular and tagged beat, boscomac, delay, drum, drum machine, echo, echophonic, free samples, instrument, Samples, Sampling on November 19, 2012 by peterdines.